Here is a quick look at our family, Bob and I are both 3 generations from farming so we do lots of things a little differently. First and foremost is our philosophy that everyone will live out their natural lives here. 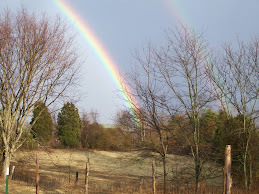 We have been vegetarian/vegan for almost 30 years now so while we hope everyone can contribute to the well-being of the farm and land we do so with respect and a view that all beings are created equal. I'll save the rest of the animal respect soliloquy for another post tho. Just want you to know from the outset so there won't be any misunderstandings and that when we speak of our family we do mean it in the full sense of the word. Other things we do that may not be the norm for some folk is being as holistic as we know to be. That starts out be designing our farm from a permaculture point of view. Rotationally grazing and keeping pastures rested. Having some of the chickens in with both the sheep and the goats to help keep parasites in check. And I make an herbal tonic that everyone gets to boost health that and we all eat kelp too! As a whole this seems to be working, everyone is hale and hearty but we have much to do and much to learn. I hope you enjoy some of these photos and please do ask questions if you have any. Here is Fancy of the 3 Dorset girls that began our flock. They are friendly, easy going and have lovely fleece, that is soft, crimpy and dyes like a dream. 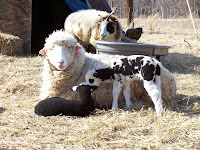 Soon after the Dorsets, we found a wonderful breeder of Nigerian Dwarf Dairy Goats, Barb Halligan of Cornerstone farm. From Ellie, Grace and Zoe was the beginnings of our herd. Llew the black llama gelding is the herd guardian and he is ruled by Lashes who also likes to sunbathe. Lambs! Having 5 Mums give birth really explodes the flock, now the flock numbers 19 in total. What we were surprised about was how colorful the DorsetxJacobs are, so I'll have lots of brown wools to both sell, as well as spin and weave with. Do stop over at our web site www. littlemeadowsfarm.net to see most of our sheep and our Adopt a Sheep Program. Mr. Bunny came to live with us last Feb., his original name was Thundercloud because he was all grey. After his first shearing tho he is now a white coated guy. Still a sweetie and is doing very well living side by side with Ranger a French Angora bunny gifted to us by Meg. Their fiber is carded into the sheep wool to spin up warm & soft yarns. They do not live in cages but in special enclosures on grass. This summer we added 3 lovely Corriedale girls to the flock, Betty & Mabel are Precious' twins and the three of them have blended in well. Precious' fleece is micron tested at 24 so is extremely soft - we expect Betty & Mabel to have very similar fleeces too. Iris and Gardenia, the Alpine Dairy goats are the newest girls here, they are milking a gallon per day so we have lots of milk for soapmaking and cheesemaking. I am missing photos of our hens so that'll have to wait for another time. In the meantime thanks for looking and reading! I would love to learn more about Mr. Bunny: what is his enclosure like? does he need special care so that his coat is still usable as fiber? I've been curious about angoras/fiber but don't like the whole 2 x 4 wire hutch idea. Thanks! Hey Megan, Mr. Bunny is soon to move into new digs as outlined in my latest post - it's going to be fenced in with 2x4" welded wire in a rectangle 15x25'. If he's on grass his coat stays fine - I only have a little stuff in his fleece if he gets into straw or hay too much. For the most part where he collects anything is in areas that I skirt off anyway. Definitely I think this is the way to keep bunnies because he can run, hop, sit up in his "Up Periscope" mode, interact with the sheep, goats and chickens. But let me warn you Angora bunnies are work because they must be either sheared or combed out on their schedule - no putting it off or they matt and can become sick from wool impaction caused from self grooming. Mr. Bunny is sheared - he is a German but Ranger is a French, so he's combed out. Combing out needs to be down over a week or 2 but is less stressful than shearing since you needn't worry about cutting their skin. These boys are very affectionate and if you want an Angora, you might see if you can actually keep him inside as outlined by many of the Rabbit Rescue sites. My house is very small so I don't have that option yet.